Celtic crafts are usually used to celebrate Saint Patrick's Day, but there are a number of other Celtic feasts to celebrate throughout the year, including Samhain (or Halloween, an originally Celtic feast) and Scottish feasts such as Burn's Night. For families with a Celtic heritage, these crafts are appropriate year-round, and reading Celtic mythology also provides a great opportunity to make some related crafts. A bodhran is a traditional Irish drum that is easily made with some simple materials. It is ideal for older children and will require assistance with younger kids. Once prepared, the bodhran can actually be played, making it a fun and practical craft. Celtic knots are easy to create and make a beautiful craft idea for homemade cards or gift wrap. You could also make a Celtic knot, using various colors of construction paper. Make a homemade paper leprechaun hat to wear during Saint Patrick's day or any other Celtic feast. 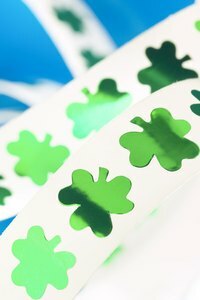 Make paper shamrocks to decorate for any Celtic feast. Make a string of shamrocks to hang in the living room or classroom. Paint a clay pot and decorate it with shamrocks, leprechauns and rainbows. Then fill it with green grass and gold chocolate coins for a crafty Celtic gift. Of course, you can also be crafty in the kitchen. Decorate green-dyed cupcakes with shamrocks, simple Celtic knots or bishop's hats for Saint Patrick's Day. A leprechaun trap can be made out of a cardboard box and decorated with alluring "traps" (particularly rainbows) to trick any leprechauns that might be lurking about. Click on the link to AmazingMoms below for a great example of a leprechaun trap. The mermaid is a creature taken from Celtic myth, and making a mermaid out of clay is the perfect craft for older children on a rainy day. Click on the Crafts for Kids link below for an example.